Vertues aren’t usually compared to buses, but the sudden availability of second hand boats for sale just now immediately suggests a rethink on this matter. For months now there have hardly seemed to be any on the market, and now we’re awash with quite a selection of distinctive boats, all of them very special in their own way. Last month we saw how Fionn, Varna and Icebird had all come onto the UK market, along with the grp VII Patience. Well, now these boats have been joined by four more wooden boats and another Bossoms built grp VII. 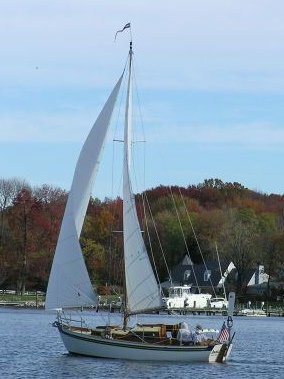 V90 Ariel – Built at Elkins, Christchurch in 1958; Lying at Galesville, MD. USA; For sale £28,578 with Midcoast Yacht & Ship Brokerage; Outstanding example of classic English craftsmanship. Not wishing to make too much of the second-hand vertue market on this website, it is nonetheless interesting to compare the distinctive individuality of all of these boats. I may be biased, but as a starting point I would say that of all of them the ARIEL is as near to the quintessential Vertue as you are likely to get. Built by Elkins in 1958 with their usual hull planking of Mahogany topsides and Teak bottom, I bet she also has Elm garboards, in the classic English manner, like my own boat, built by them a little over ten year later. Simple, light weight and practical decks are canvas covered, the cream paintwork setting off the varnished coachroof and cockpit areas perfectly. Varnished spruce spars, imported from Sitka, contrast with the dark teak, completing the picture of a real little ‘classic’ to perfection. V89 Mea – Built at Cheoy Lee in 1959; Ocean coachroof; Lying at West Mersea, Essex. 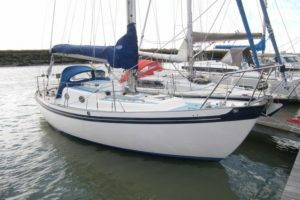 UK; For sale £16,500 with Woodrolfe Brokerage; Unusual, early Cheoy Lee built ‘ocean’ configuration with masthead sloop rig. 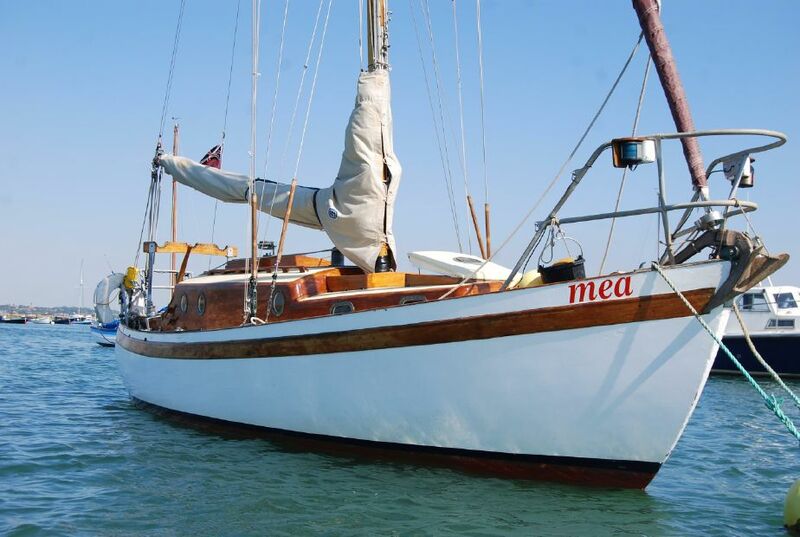 A year later, MEA was launched by the Cheoy Lee Shipyard in Hong Kong, for a British owner who subsequently sailed her back to the UK. Unusually for Cheoy Lee she is built without a doghouse but instead has a long, low, stepped coachroof, described by Humphrey Barton as a design for ‘extended ocean cruising’. The appearance in profile is just like a smaller version of the Hiscock’s famous Wanderer III. These ‘ocean’ vertues are one of the least common variation of the design, with perhaps ten or dozen in existence. Clearly ICEBIRD, listed last month, is a close sister ship and even FIONN shares a similar coachroof design, even though she has always been gaff rigged. Their interior layout generally provides for a much larger galley and chart table area aft than their more common sister ships, with a pair of settee berths in the saloon and the heads and storage space forward. 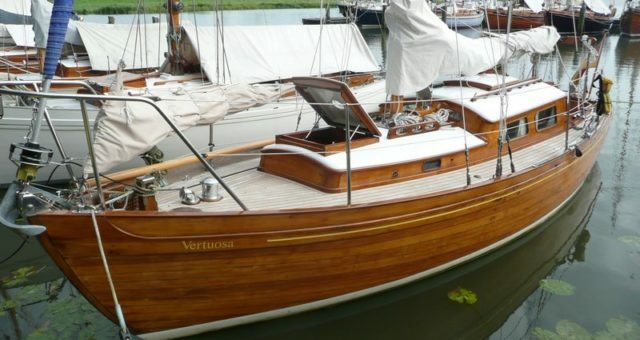 V122 Vertuosa – Built at Cheoy Lee, Hong Kong in 1963; Long doghouse; Lying at Kampen, Netherlands; For sale £25,000 with rudigrimm@web.de; Classic teak built mid 1960’s UK import, still with varnished topsides & recent teak deck. VERTUOSA is now for sale in the Netherlands and is an entirely conventional example of one of the dozen or so Cheoy Lee built vertues imported by Denis Hoolahan into the UK in 1963. 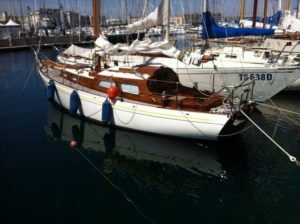 Very unusually she still has her original varnished teak topsides and is beautifully maintained. A similar boat, TANERA also has the usual long doghouse, complete with large side windows, of the 1960’s vertues but was planked in Iroko by Perry who built a small number of boats to this design. By then the standard interior design included two saloon berths and two v-berths right forward with the deck stepped mast allowing a passage way between the saloon and fo’c’s’le to be closed off to create a heads compartment between the two. VII 24 Poppy – Built at Bossoms, England in 1989; Long doghouse; Lying at Suffolk Yacht Harbour; For sale £22,000 with www.clarkandcarter.co.uk; A serious looking cruising boat with small doghouse windows. Another grp Vertue II to come onto the market this month is POPPY, with the Bossoms grp version of the ‘ocean’ coachroof. This is very similar to Sparrow, surely the most famous of the grp boats and certainly looks pretty bullet proof. So with prices lower than they have been for years, and most variations of the vertue design currently represented, it is clearly a very good time to go vertue-hunting. V146 Tanera – Built at Perry, Cosham in 1968; Long doghouse; Lying at Adriatico, Italy; For sale £31,889 with Yachtworld; One of several Perry built Vertues to high spec with teak deck. About as rare as the ‘ocean’ vertues are the early, mostly pre-war boats built in the ten years after Andrillot’s launch in 1936. Take out the war years and you are left with a very small number of boatbuilding winters. Of these early boats, both Epeneta and Kawan have been lost at sea. If Serotina V14 was the first of the post war vertues to be built with a doghouse there remain only a dozen early boats with simple, low coachroofs, and all originally with keel stepped masts. 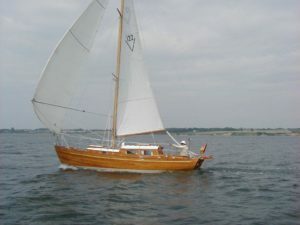 So it was with great joy that I opened an email the other day, sent by the current owner of Charis V4, the second Elkins built boat, to say that she now resides in Maine on the east coast of the US. Occasional published images of her over the years have shown that she has been altered on deck but we hope to bring more news of this really early pre-war vertue before too long. Thanks to everyone who has been in touch with updates and news and please keep the emails coming, and together we will build a worthwhile resource for every Vertue enthusiast to enjoy.